PT Nutrifood Indonesia, an international-quality health foods and beverages manufacturers, has appointed PT Anugrah Argon Medica as the new Nutrifood’s distributor for medical channel (Pharmacies, Hospitals, Clinics, Drug Stores, and pharmaceutical wholesaler). This partnership is effective September, 1st 2013. With over 30 years of combined experience in pharmaceutical distribution, AAM qualified team provides strong market exploration to improve products penetration in medical channel. 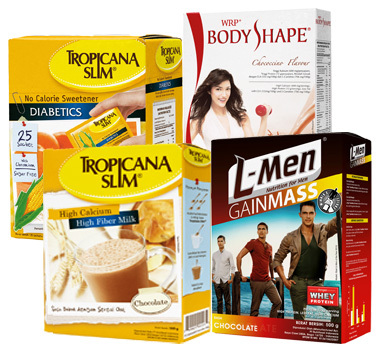 Some of the products that AAM distribute such as Tropicana Slim Sweetener, Tropicana Slim Diabetamil, WRP, Hi-Lo, and L-Men are well-known products that benefit for health and diet. As a commitment in maintaining its products quality, currently Nutrifood have met various international standards such as: ISO 9002:2000 certificate, ISO IEC 17025:2005 certificate, ISO 9001:2008 certificate, and also Halal certificate from LP-POM MUI.